Here is Thursday’s post from Barb Wooler, director of crisis response at Encompass World Partners, as a multi-national team gears up to travel to Ecuador to help with earthquake relief. While Walter Testa (left in photo at right) will not be deploying with the team to the earthquake damage zone in Canoa, Ecuador, he is playing a critically important role as Team Coordinator. He will continue to provide logistical support to the team during their ministry from May 21-28th. PRAY that God will give Walter wisdom to handle the inevitable logistical problems that will come up during the teams deployment. Pray that internet access will allow for good communication between the team and him. 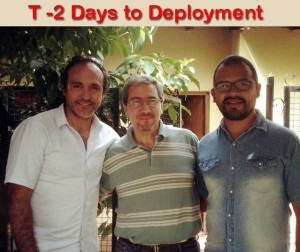 Also pictured are team leader Eduardo Pizzi (center) and team member Marcelo Gonzalez. All three men are from Argentina.